Exerpts from a recent talk given by the Acasta's Surgeon to the Ladies and Gentlemen of the Louisville, Kentucky chapter of the Jane Austen Society of America. Discussions include the Battle of the Nile and the song 'Heart of Oak'. As it seemed that there would be a good deal of time before we would be able to intercept the American privateer, whose identity it would seem was generally believed to be Young Teazer, the order was given for hands to breakfast, I went below and Vasserman brought me coffee. Afterward, Reid and I made morning Sick Call at the mainmast. We treated the number of ulcers and bruises to be expected from a crew so long exposed to the elements and the wet. The saltwater and handling of coarse rope is hard on the hands and feet of a sailor. The effected men formed a line for their treatments, but all eyes were distracted by the sails on the horizon as we went about our work. "She can't be caught that one." said Mr. Rutherford as he stepped forward, hands held out to expose his neglected sores. "What's that?" asked I looking up from my chest, removing the bottle of salve. 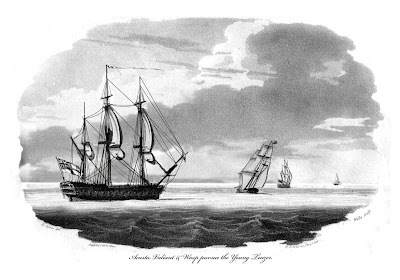 "The Young Teazer that is Sir," says Rutherford, "she's crafty, raised our own colours in Halifax Harbour to escape capture, they didn't even know she was there 'til she was long gone. She'll not be taken easy." "Mister Rutherford," answers I, "I'm certain the Captain would not appreciate such stuff and nonsense. Regardless of who she is, it is only a ship, and any ship can be captured if pursued long enough by the right Captain." "Oh yes sir, I didn't mean no disrespect to Captain Freymann or nothin'. Just a bit of idle talk..."
"No, I am certain you did not. As for these hands," I scolded whilst applying the salve liberally, "you should not have waited so long before you brought these sores to my attention. Neglect on this order is akin to rendering yourself unfit Mister Rutherford. I shall wrap them tightly and suggest you wear gloves for several days while on duty. Keep them as dry as possible when off duty." "Y-yes sir." Rutherford saluted with a freshly bandaged appendage. Once I was certain that my mates had things in hand, I paid my two patients belowdecks their forenoon visit. Downie's condition seems generally improved since his emetic, but I suspect that my greatest treatment came in the form of stopping his grog. His speech is clear and his much complained of 'headache' abated. If he remains in this manner for the remainder of the day, I shall release him back to duty. Ford's fever is down from yesterday and he seems to have regained some of his appetite. At noon, I rejoined the officers on the Quarterdeck to have another look through my glass at the Wasp and her quarry. They were a great distance off, nearly over the horizon. Resigning myself that it would be a long chase, I went below to have something more substantial to eat. At dawn, I was awakened by the drumming To Quarters, wherein Mr. Reid, Mr. Vasserman and I made ready the surgery. 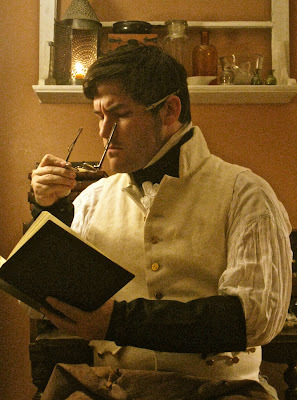 Afterward, it was pointed out to me by Vasserman that I had neglected to fix my cravat, and he straightened and tied it for me. Only then did I venture up on deck to ascertain the situation fully. The men seemed to be making the proper amount of haste in readying their stations in this ungodly hour, several nearly knocking me to down whilst rounding corners quickly. The Acasta had been off Cape Sable some distance with Capt. Oliver's HMS Valiant through the night. I bid the officers good morning and joined them in having a look at the excitement through my glass. The lookout had spotted His Majesty's Sloop Wasp in pursuit of and American vessel. I could see them both fairly clear as they came around the area the officers referred to as 'Baron Bank'. There behind the Wasp's prey flew the American flag. "Does anyone know who that American vessel is?" queried I, still watching it. 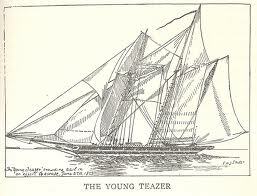 "Looks to be 'Young Teazer' Doctor, make note of the 'Alligator' that makes up her figurehead." I scarcely had the heart to mention that their figurehead looked nothing like the Alligators I'd seen drawings of. I turned my eye over to the nearby Valiant, and through my glass I could espy Capt. Oliver and his officers watching the Wasp's approach from their own quarterdeck. Through my lens, Oliver lowered his own telescope and began to silently issue orders to his men. The vague sound of distant and incoherent shouting could be made out across the water between the Acasta and the Valiant. There came a great shouting on the Quarterdeck as orders were giv'n and repeated and then passed down the chain of command to give chase.